Mcgruff the Crime Dog monster truck driven by Rod Wood leaps a row of cars Friday night at the Tucson Rodeo Grounds. 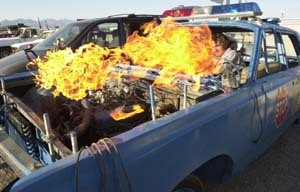 Road Kill Racing team member David Baker lights up a flame thrower which is mounted in the team's demolition derby car. 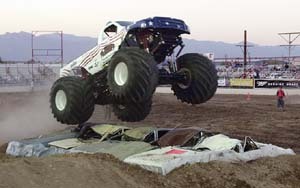 Pat Gerber of Bakersfield, Calif., jumps over a line of cars. In yet another glimpse into the decline of civilization, about 1,500 people paid $10 a ticket Friday night to watch the Tournament of Destruction at the Tucson Rodeo Grounds. It began with the temperature about 100 degrees, dust as thick as fog, led by Demolition Derby car No. 4,100, equipped with a large Confederate flag, police lights and a flame-thrower mounted on its hood. "Let's hear it for the Demo Derby beauty parade," said the public address announcer, who, in lieu of a performer, tape or music, sang the national anthem himself. A man sitting in the front row, wearing a "Progressive Roofing" T-shirt, had bright yellow plugs in each ear. "Why don't you sit in the back row and take out the ear plugs?" I said, fishing for a quote. "What's it to you, dumb a-?" he replied. No, it wasn't the Ice Capades. 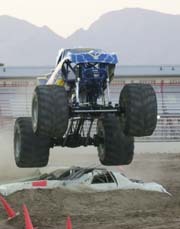 According to the crowd's reaction, the night's highlight came when Pat Gerber of Bakersfield, Calif., revved up the 1,200 horsepower Monster Truck engine in "Shocker" and fractured neighborhood noise ordinance laws from South Tucson to Oro Valley. Gerber has spent well into six figures on Shocker (and its elaborate travel trailer) and in doing so, created a 3-D body that comes off as a cross between a San Diego Chargers helmet and something out of Batman. "How tall are those tires?" I asked. "Sixty-six inches," he said. About as tall as Will Bynum, for instance. Friday's show - Pickup Trucks on Steroids - will be repeated tonight. Same place. Same time. Same car-crushing, ear-splitting, behavioral deficits. 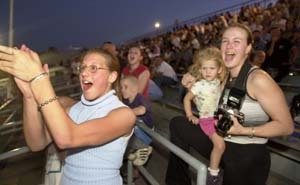 LeAhnna Baird,top left, and Shannon Baird, with 2-year-old Chloey Baird, cheer on the action in the demolition derby. America's obsession for entertainment has created far more than a Friday night of Monster Truck racing/Demolition Derby/Motocross Madness in Tucson. What's the attraction? Well, what's the attraction of the Westminster Kennel Club Dog Show? In a culture that insists upon, and supports, more than 100 cable TV channels, the Tournament of Destruction is simply another channel. It's no different than several thousand fans lounging on a beachfront somewhere in California as Miss Budweiser, a superboat, soars across the lake at 105 mph, nothing but a blur to the human eye. It's better than staying home and playing pinochle. In the 1960s, we had bumper cars and a wrestler wearing a mask matched against a bear. Monster Truck racing has become our bear-wrestling of the 21st century. True story: In 2001, 17 of the 20 largest crowds for sports events in this country involved racing (car or truck) or some sort. The Learning Channel, a distinguished cable TV outlet, has regular features of "Daredevils" and "Junkyard Wars," which are all about car and truck racing. ESPN2 would go out of business without car racing. The History Channel, which is educational if nothing else, features car and truck racing in its regular programming of "Modern Marvels" and "The Secret World of Modern Trucks." I confess: as entertainment goes, it's a step up from the Insight.com Bowl. Out at the Tucson Rodeo Grounds on Friday, there were no secrets. Moms and dads broke away from the ballfields to bring their kids to watch Motocross daredevils soaring over dirt mounds at ridiculous speeds, side-by-side with other drivers. The audience demographic wasn't any different than at a Little League game. It was hot and dusty, and the guy next to me blew enough cigarette smoke to give me stage 5, second-hand cancer. But there's something about watching "Kongo Kong," an 11,000-pound Monster Truck, put some serious tread over the hood of an old Buick that you can't get anywhere else, except maybe the Jerry Springer Show. It makes baseball come off as a spelling bee.